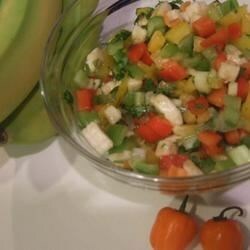 "This is a Jamaican-style banana salsa." Mix together the banana, red pepper, green pepper, yellow pepper, cilantro, green onion, lime juice, brown sugar, ginger, olive oil, and habanero pepper in a bowl; season with salt. Serve within 1 hour.